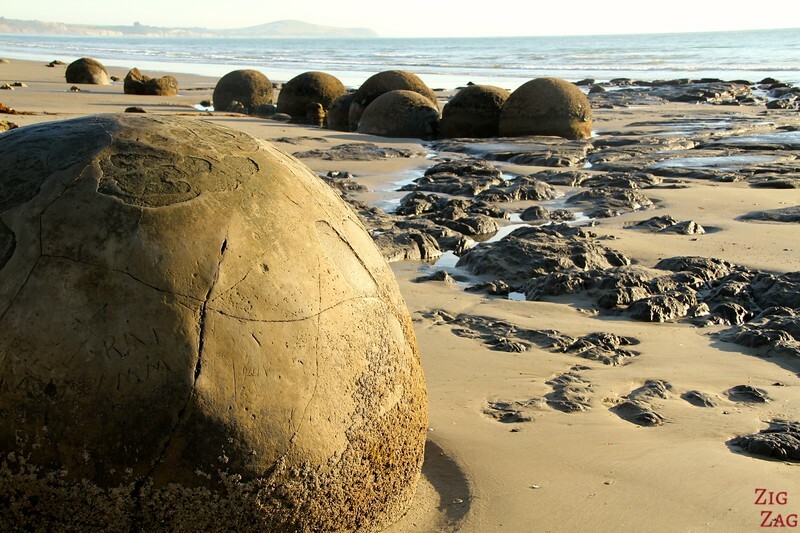 The Moeraki Boulders New Zealand are one of the most fascinating geological feature on Earth. 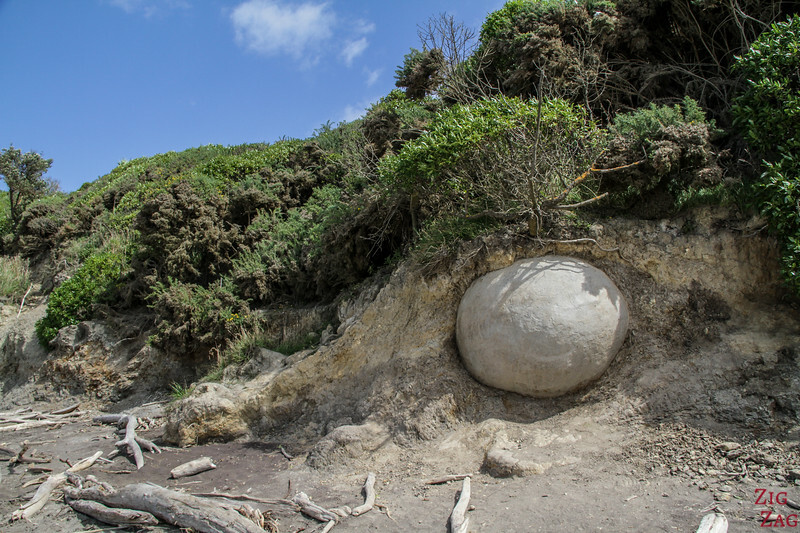 The giant rond rocks seems to have been created by giants. 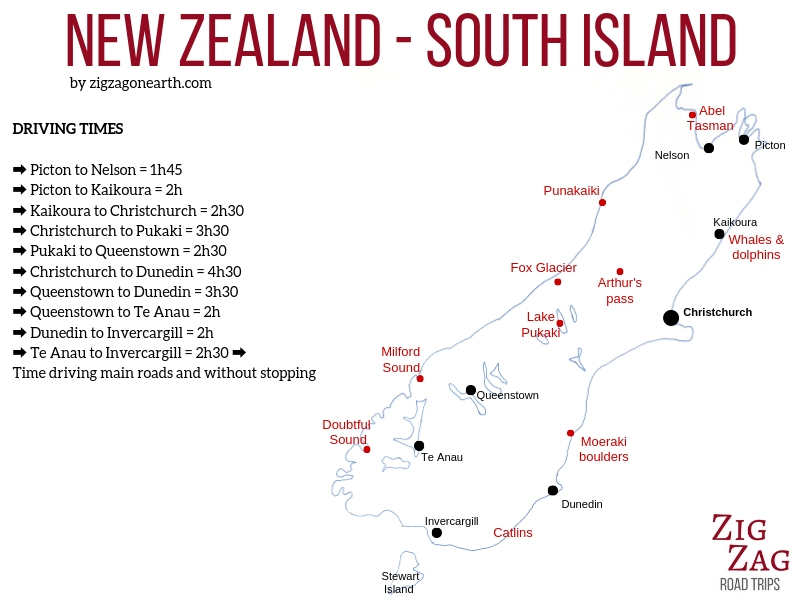 So they are at the source of scientific fasciantionand Maori myths. 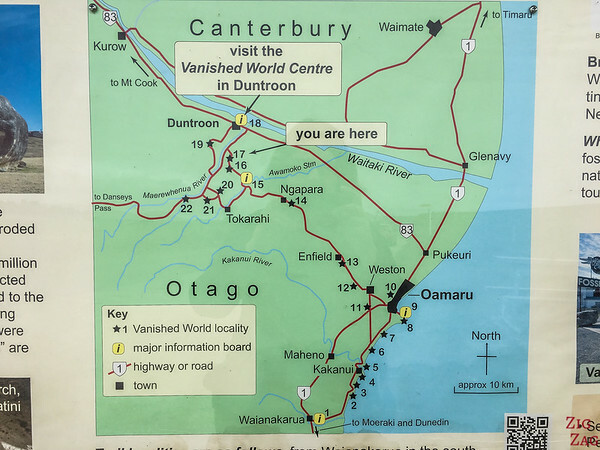 Below is my guide to help you make the most of your visit. 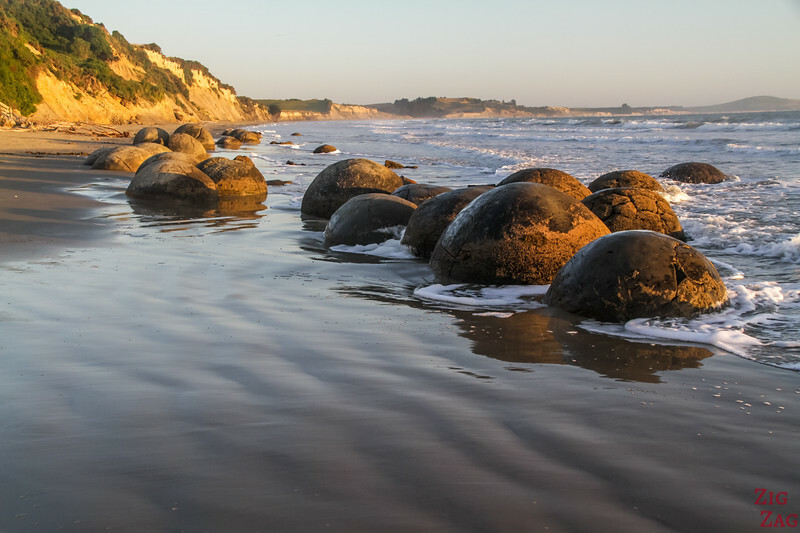 What are the Moeraki boulders and why visit? 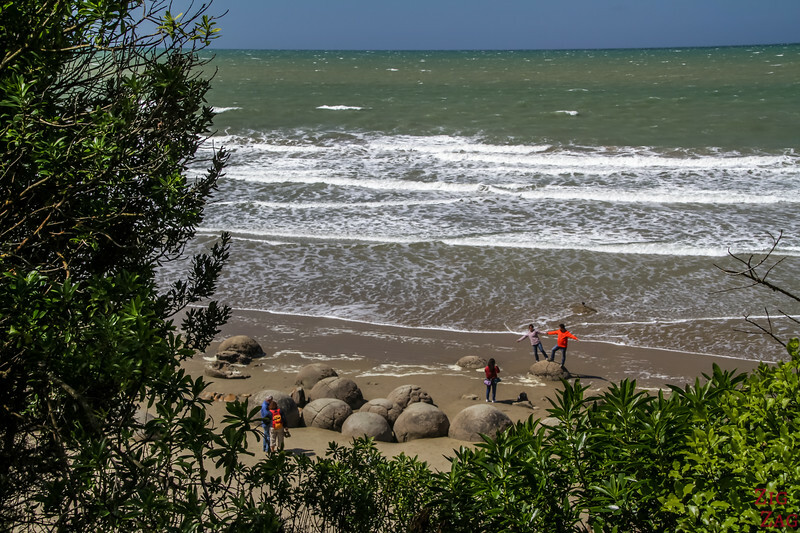 What are the Moeraki Boulders? 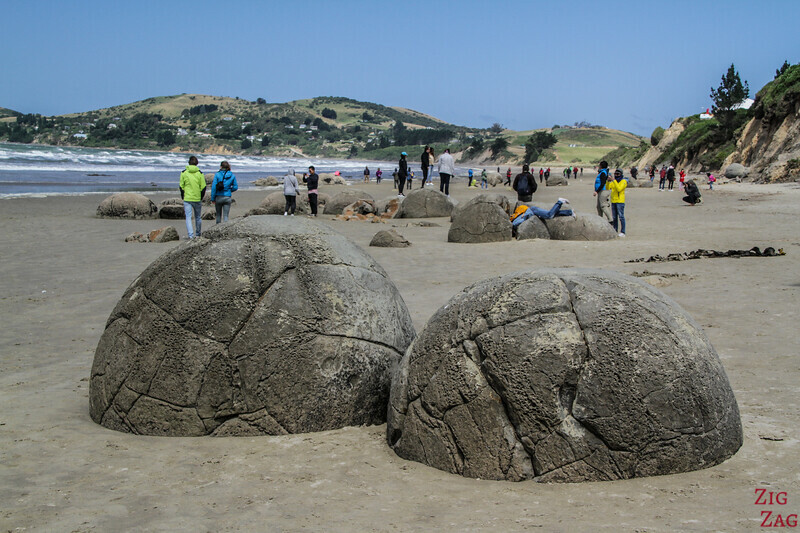 The Moeraki boulders are one of the most intriguing geological formations that I have seen so far (with the giant’s playground in Namibia). 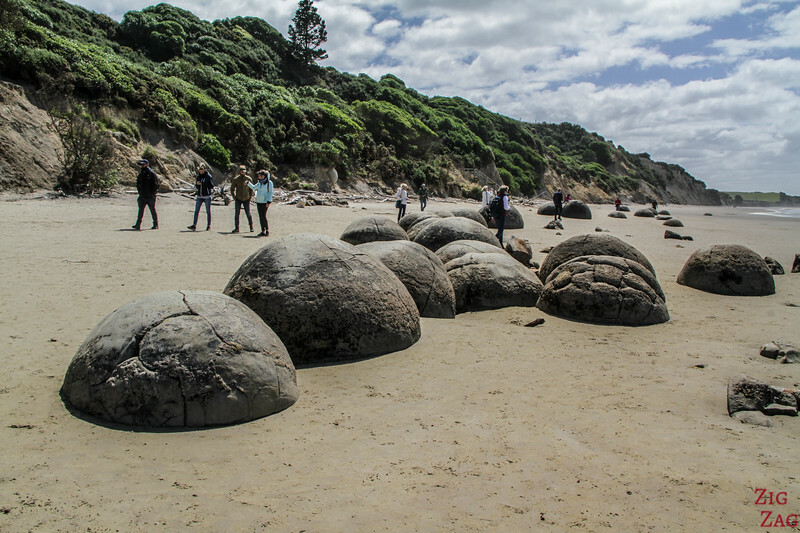 They are huge boulders set up on the flat sandy Koekohe beach. Most are 1 to 2m in diameter but some of them reach 3 meters in diameters and weigh several tonnes! What makes them so impressive (apart from their size) is that they are all almost perfectly round. 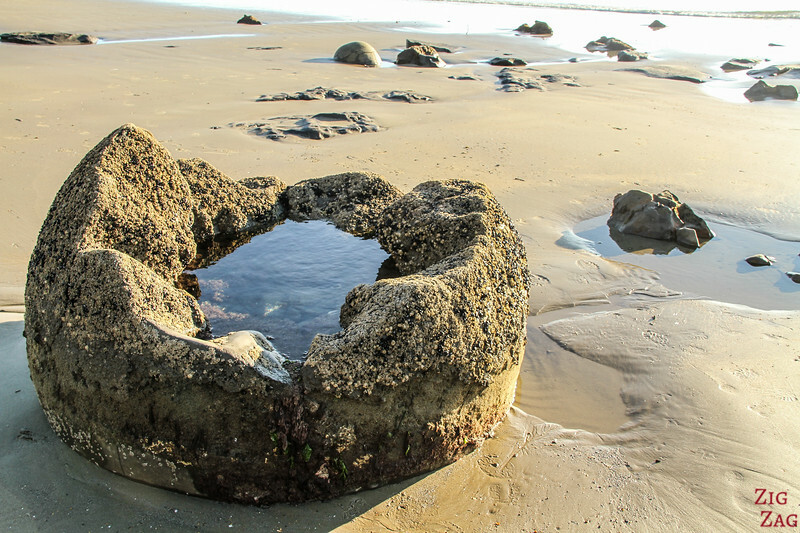 There are over 50 boulders visible on the beach. 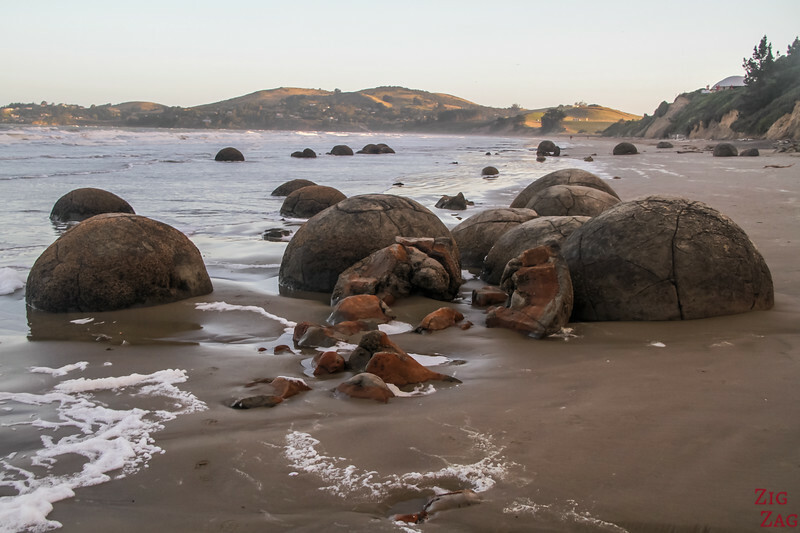 It is believed that those boulders were formed by precipitation of calcite in mudstone over millions of years on the seabed. 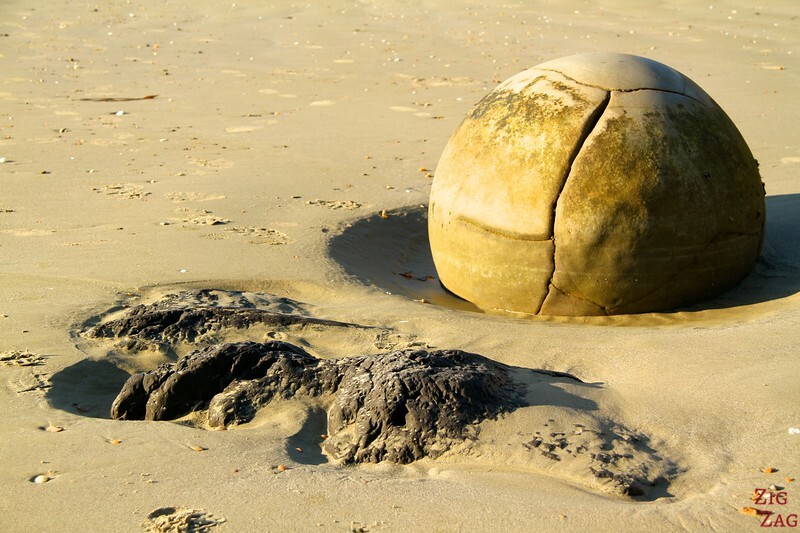 The phenomenon is called concretion. It starts with an organic nucleus (shell, fish-bone, or piece of plant or animal).Then sediments aggregate around it (layer upon layer) cimente by complex chemical reactions with minerals. They formed 65 to 13 million years ago! 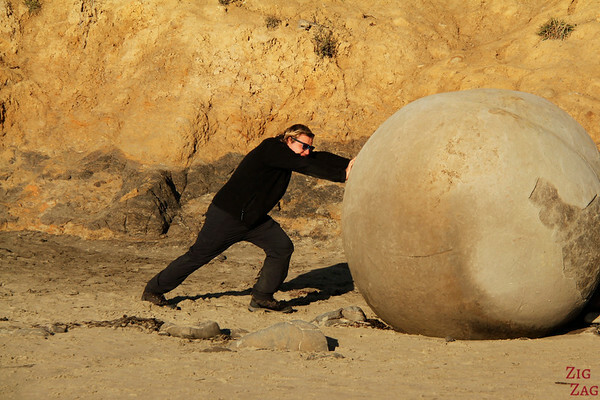 How did those giant boulders get on the beach? When the land rose from the sea, the erosion did it works and revealed these giants, letting us touch old Earth history! Below you can see one that is still in the cliffs. The erosion as not yet fully revealed it. 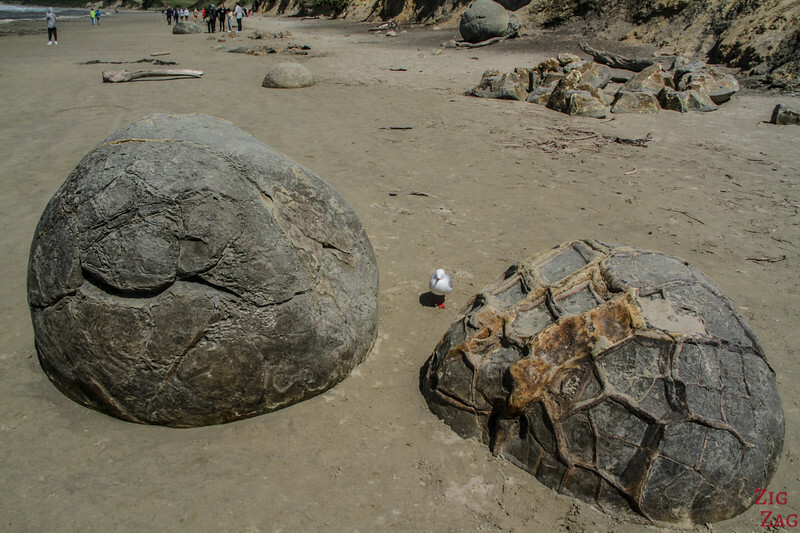 Why are some of the Moeraki boulders cracked or opened? Young cracks are called septaria. 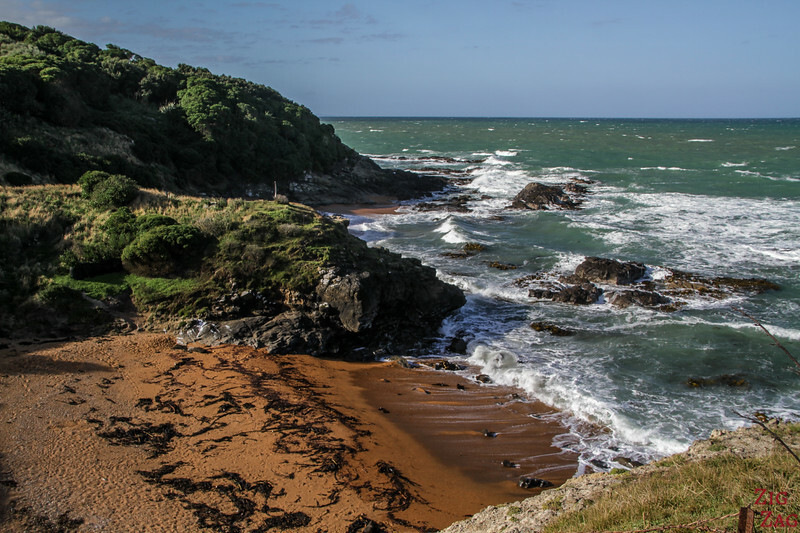 Moeraki is the name of the village nearby (and not the name of the beach by the way: it is Koekohe beach). 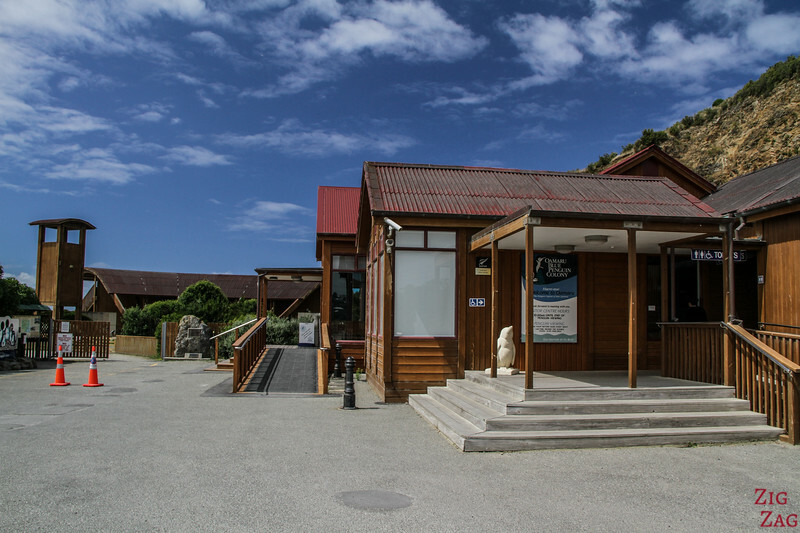 It used to be a whaling station. But I have not found more information on the history behind the name. 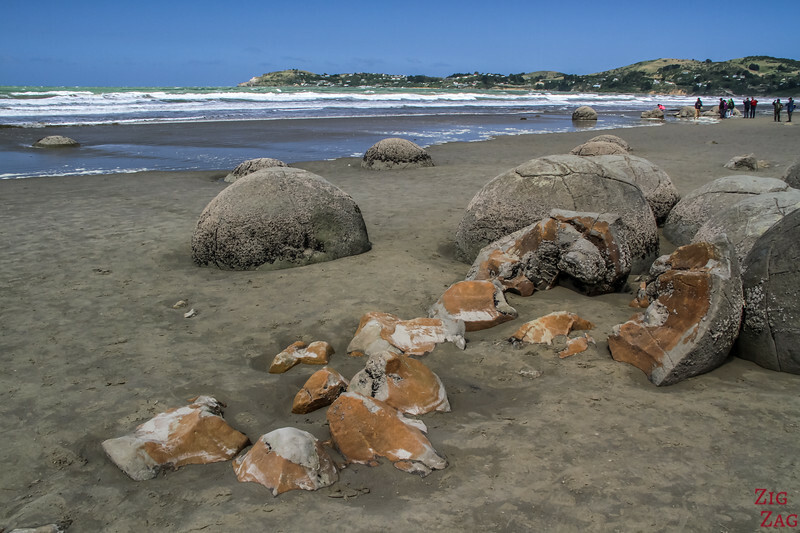 Maori legend tells that the boulders are remains of calabashes (kumaras and eel baskets) that washed ashore and were turned into stones after the legendary canoe, the Araiteuru was wrecked nearby. 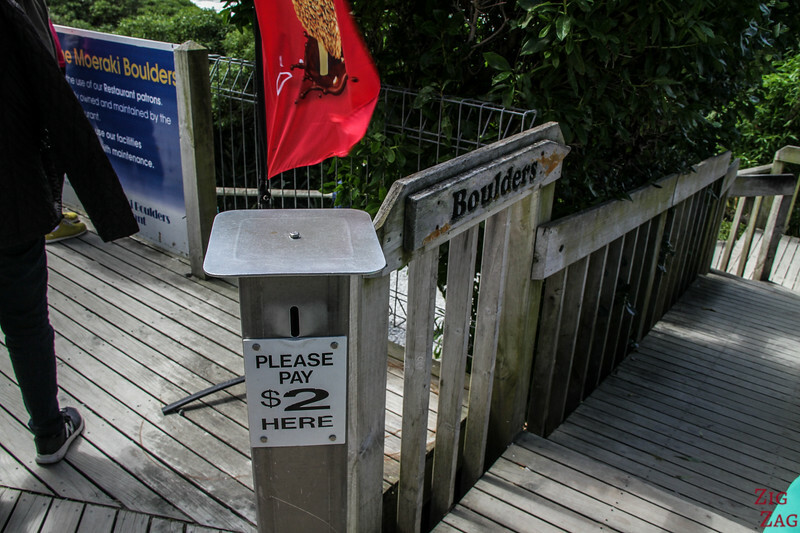 The world learnt of the boulder only around 1814. Before documentation was limited. 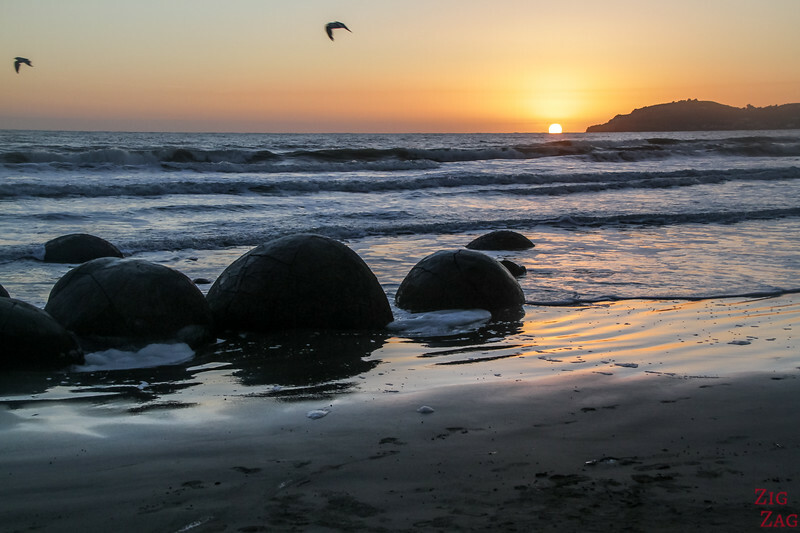 The absolute best time to visit the Moeraki boulders is between Low tide and Mid tide and at sunrise if you can. However they are fascinating and visible all day long. 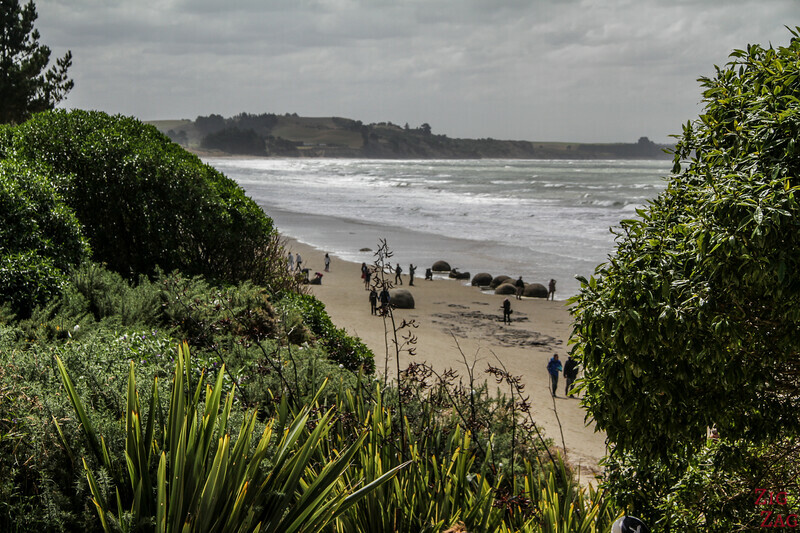 Can you see the moeraki boulders at high tide? The answer is yes. But more than half of them will be completely in the water. 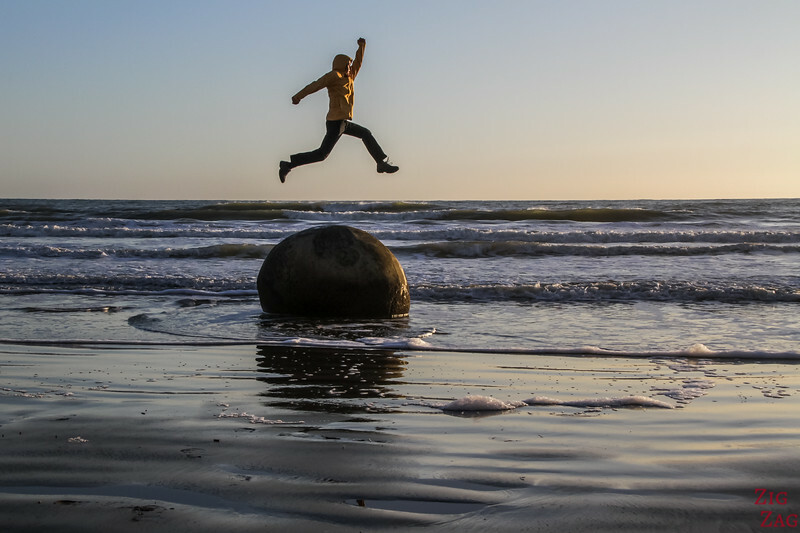 Be careful with your camera and be ready to run away from water. Then there is the question of the best light. I visited during the day, at sunrise and at sunset. You will be almost alone. The sun goes behind the cliffs so you are loosing the light. But you could still have colorful clouds pas sunset. Before I share more pictures of the amazing boulders, here are some practical information to plan your visit to the boulders. walk - a wood staircase takes you from the parking to the beach where a lot of the boulders are. You can go for a stroll on the beach and find more of them. There are over 50 boulders. 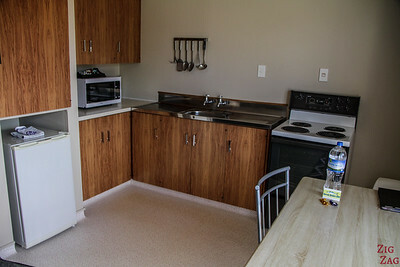 There are no accommodations at the beach itself. 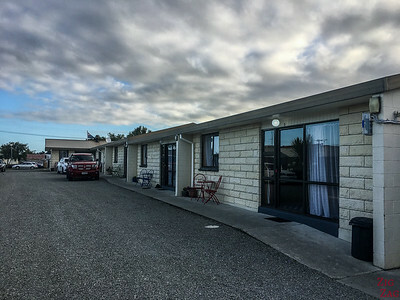 However there are some in Moeraki and Hampden, including a holiday park. 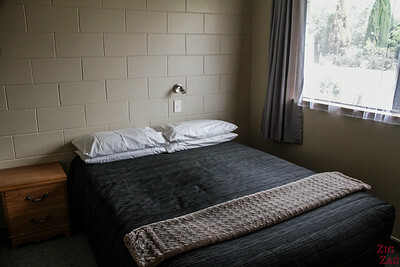 They are only 5 to10 min drive away. 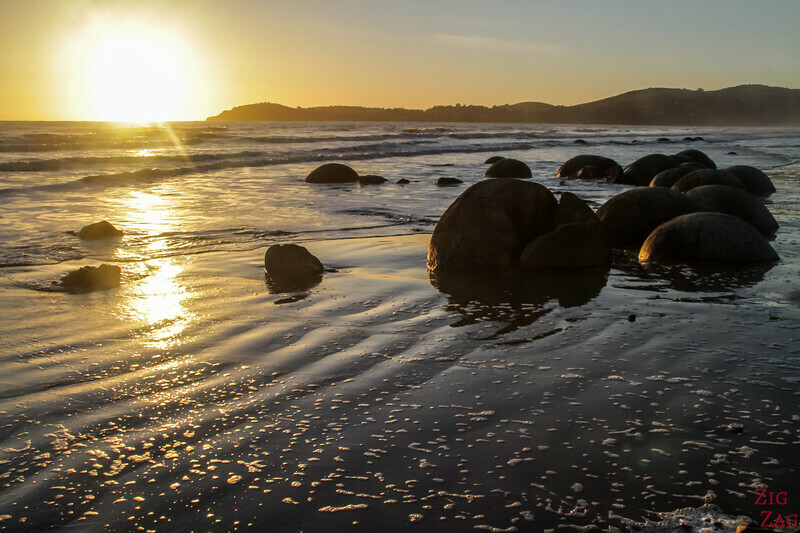 If you want to stay close to the boulders to see them at sunrise, I recommend booking early. I normally love viewing landscapes from a higher point of view. So I always look for them. 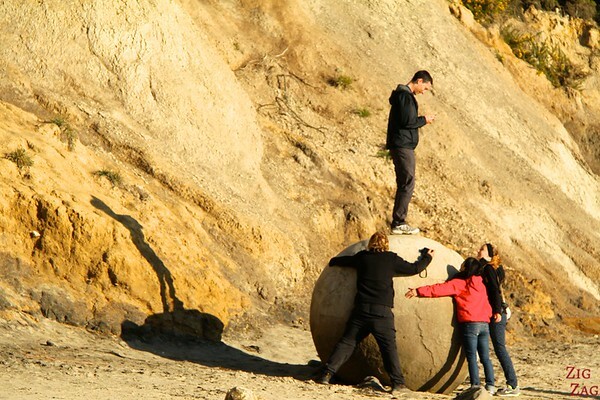 However I must admit that at the Moeraki boulder beach, views are better from the ground. 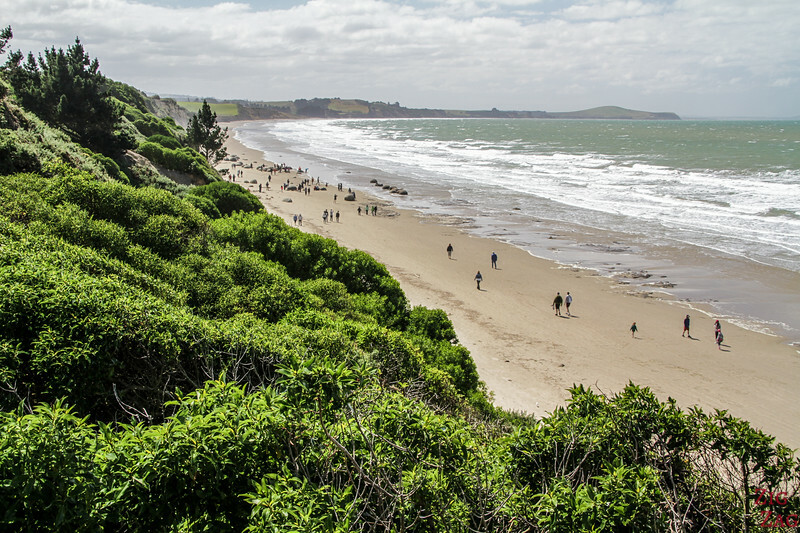 There is an official walk along the beach and on the cliff above. It is officially closed because the staircase at the end (past the boulders) is not stable anymore. However you can still walk the forest part (starts on path left of café) and get a quick view of the boulders from the platform. This is not much; It is not worth it if you don't have the time. 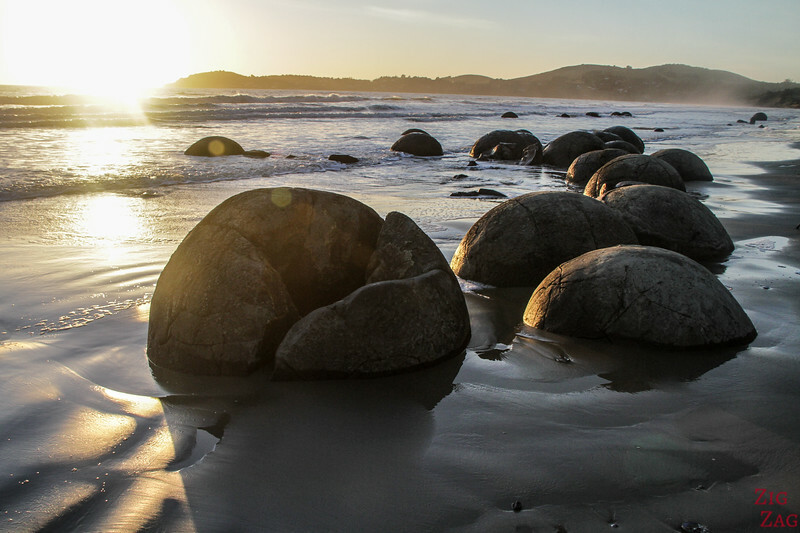 It is so impressive to see all those boulders perfectly round on such a flat classic beach. It is hard to get your mind around the idea of how they were created. There is quite a spread of them, so you can move along where there are less people. Some are perfectly round, others are cracked or opened. Erosion is creating slightly different structure. Every single one is fascinating. During the day you will see a lot of pictures having fun with them. The first time I visited, I was with a group so it was great for pictures. 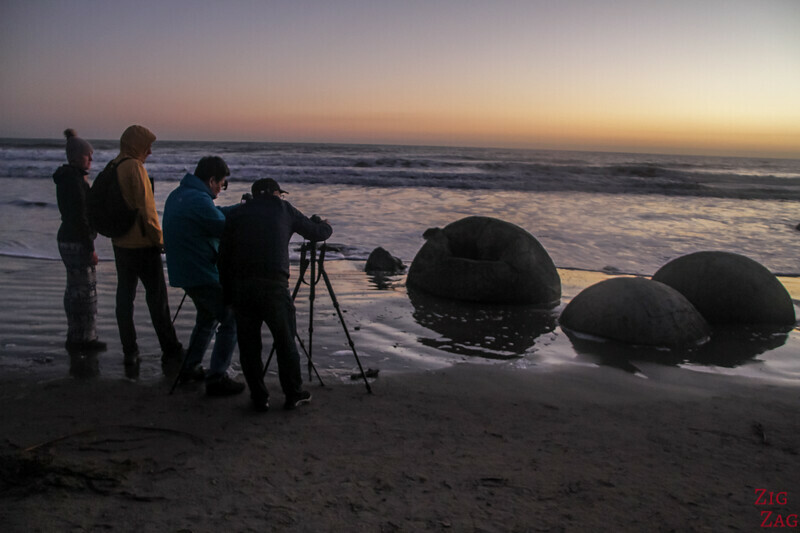 As I wrote earlier, the best time to photograph the Moeraki boulder is at sunrise during low to mid-tide. And if you are fascianted by geology, the boulders are acutally part of the Vanishin world trail. YOU could take the day following it, or just pick a few spots for half a day. 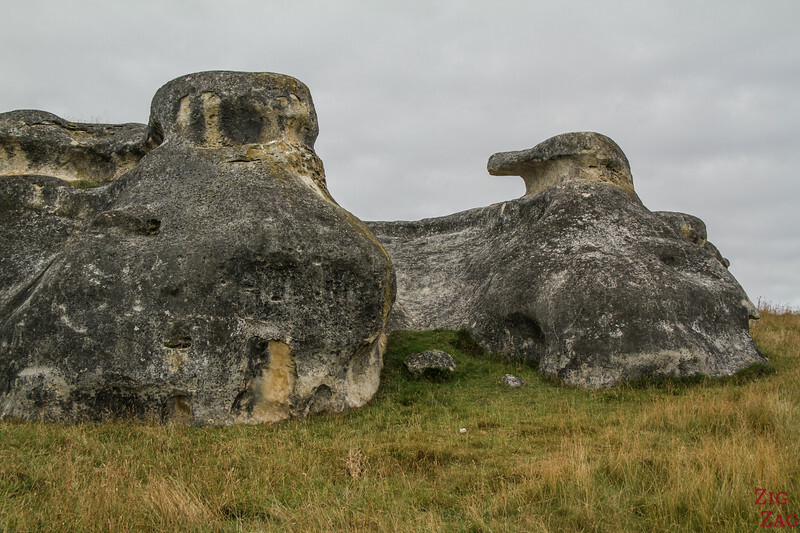 I recommend the Elephant rocks and the museum at Duntroon. And you, what intriguing geological features have you seen? Amazing natural wonder you got to see! Really interesting!